• You will let us know about inappropriate content of which you become aware. If you find something that violates our Community Guidelines, please let us know, and we’ll review it.We reserve the right, in our sole and absolute discretion, to deny you access to the Platform and/or the Services, or any portion of the Platform and/or the Services, without notice, and to remove any content that does not adhere to these Community Guidelines. The Platform and the Services are only available for individuals aged 13 years or older. If you are 13 or older, but under the age of majority in your jurisdiction, you should review this Agreement with your parent or guardian to make sure that you and your parent or guardian understand it. During the registration process for Members and Merchants, we will ask you to create an account, which includes a sign-in name (“Sign-In Name”), a password (“Password”), and perhaps certain additional information that will assist in authenticating your identity when you log-in in the future (“Unique Identifiers”). When creating your account, you must provide true, accurate, current, and complete information. You are responsible for the confidentiality and use of your Sign-In Name, Password, and Unique Identifiers. You will promptly inform us of any need to deactivate a Password or Sign-In Name, or change any Unique Identifier. We reserve the right to delete or change your Password, Sign-In Name, or Unique Identifier at any time and for any reason. Members may be charged fees for using the Services. Other charges initiated by third parties in connection with providing Services may also apply. The Platform and the Services contain material, such as photographs, software, text, graphics, images, sound recordings, and other material provided by or on behalf of KittyShield (collectively referred to as the “Content”). The Content may be owned by us or third parties. The Content is protected under both United States and foreign laws. Unauthorized use of the Content may violate copyright, trademark, and other laws. You have no rights in or to the Content, and you will not use the Content except as permitted under this Agreement. No other use is permitted without prior written consent from us. You must retain all copyright and other proprietary notices contained in the original Content on any copy you make of the Content. You may not sell, transfer, assign, license, sublicense, or modify the Content or reproduce, display, publicly perform, make a derivative version of, distribute, or otherwise use the Content in any way for any public or commercial purpose. 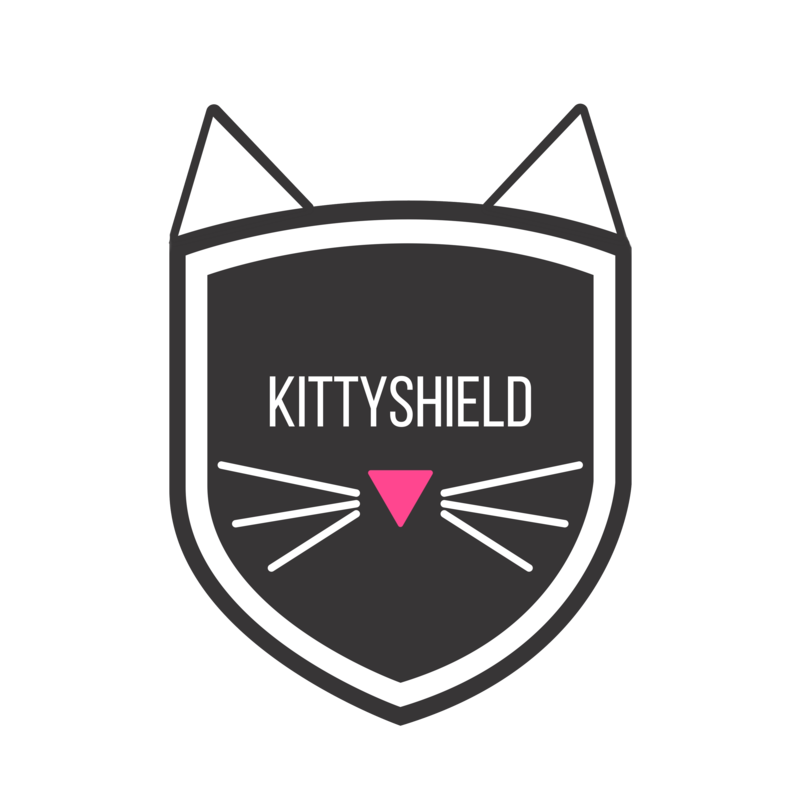 The use or posting of the Content on any other website or in a networked computer environment for any purpose is expressly prohibited.If you violate any part of this Agreement, your permission to access and/or use the Content, the Platform, and/or the Services automatically terminates.The trademarks, service marks, and logos of KittyShield (the “KittyShield Trademarks”) used and displayed on the Platform are registered and unregistered trademarks or service marks of KittyShield and The Catnip Times, Inc. Other company, product, and service names located on the Platform may be trademarks or service marks owned by others (the “Third-Party Trademarks,” and, collectively with KittyShield Trademarks, the “Trademarks”). Nothing on the Platform should be construed as granting, by implication, estoppel, or otherwise, any license or right to use the Trademarks, without our prior written permission specific for each such use. Use of the Trademarks as part of a link to or from any site is prohibited unless establishment of such a link is approved in advance by us in writing. All goodwill generated from the use of KittyShield Trademarks inures to our benefit.Elements of the Platform are protected by trade dress, trademark, unfair competition, and other state and federal laws and may not be copied or imitated in whole or in part, by any means, including, but not limited to, the use of framing or mirrors. None of the Content may be retransmitted without our express, written consent for each and every instance. As noted above, the Services provide Members the ability to post and upload Member Content. You expressly acknowledge and agree that once you submit your Member Content for inclusion into the Platform, it will be accessible by others, and that there is no confidentiality or privacy with respect to such Member Content, including, without limitation, any personally identifying information that you may make available. YOU, AND NOT KITTYSHIELD NOR THE CATNIP TIMES, INC., ARE ENTIRELY RESPONSIBLE FOR ALL YOUR MEMBER CONTENT THAT YOU UPLOAD, POST, E-MAIL, OR OTHERWISE TRANSMIT VIA THE SERVICES AND YOU WILL INDEMNIFY US IN RESPECT OF ANY LOSS, LIABILITY, CLAIM, OR DAMAGE SUFFERED OR INCURRED BY US IN CONNECTION WITH YOUR MEMBER CONTENT.You retain all copyrights and other intellectual property rights in and to your own Member Content. You do, however, hereby grant us a non-exclusive, royalty-free, sub licensable, transferable, perpetual license to modify, compile, combine with other content, copy, record, synchronize, transmit, translate, format, distribute, publicly display, publicly perform, and otherwise use or exploit your Member Content as reasonably necessary to provide the Services.If you submit Member Content to us, each such submission constitutes a representation and warranty to KittyShield that such Member Content is your original creation (or that you otherwise have the right to provide the Member Content), that you have the rights necessary to grant the license to the Member Content under the prior paragraph, and that it and its use by KittyShield and its content partners as permitted by this Agreement does not and will not infringe or misappropriate the intellectual property or moral rights of any person or contain any libelous, defamatory, or obscene material or content that violates our Community Guidelines. We do not want you to, and you should not, e-mail us any content that contains confidential information. With respect to all e-mails and communications you send to us, including, but not limited to, support requests, feedback, questions, comments, suggestions, and the like, we shall be free to use any ideas, concepts, know-how, or techniques contained in your communications for any purpose whatsoever, including but not limited to, the development, production, and marketing of products and services that incorporate such information without compensation or attribution to you. You may cancel the Service at any time. Regardless of when notification of cancellation is received, no refunds shall be made for any funds paid prior to the cancellation notification. Canceling your account does not eliminate your obligation to pay for current or past-due amounts owed to us. THE PLATFORM, THE SERVICES AND ALL CONTENT, FUNCTIONS AND MATERIALS MADE AVAILABLE TO YOU THROUGH THE PLATFORM IS PROVIDED ON AN “AS IS” AND “AS AVAILABLE” BASIS WITHOUT ANY WARRANTIES OF ANY KIND, EITHER EXPRESS OR IMPLIED, INCLUDING, WITHOUT LIMITATION, ANY WARRANTIES OF TITLE, NON-INFRINGEMENT, MERCHANTABILITY OR FITNESS FOR A PARTICULAR PURPOSE, AND ANY WARRANTIES ARISING FROM A COURSE OF DEALING, COURSE OF PERFORMANCE, OR USAGE OF TRADE.NONE OF KITTYSHIELD, ITS AFFILIATES, SUBSIDIARIES, PARTNERS, OR ITS OR THEIR OFFICERS, DIRECTORS, EMPLOYEES OR AGENTS (COLLECTIVELY THE “KITTYSHIELD PARTIES”) OWN OR CONTROL IN CONNECTION WITH ANY WARRANTY, CONTRACT OR COMMON LAW TORT CLAIMS: (I) NONE OF THE KITTYSHIELD PARTIES SHALL BE LIABLE FOR ANY INCIDENTAL OR CONSEQUENTIAL DAMAGES, LOST PROFITS, OR DAMAGES RESULTING FROM LOST DATA OR BUSINESS INTERRUPTION RESULTING FROM THE USE OR INABILITY TO ACCESS AND USE THE PLATFORM OR THE SERVICES, EVEN IF A KITTYSHIELD PARTY HAS BEEN ADVISED OF THE POSSIBILITY OF SUCH DAMAGES; AND (II) ANY DIRECT DAMAGES THAT YOU MAY SUFFER AS A RESULT OF YOUR USE OF THE PLATFORM OR THE SERVICES SHALL BE LIMITED TO THE MONIES YOU HAVE PAID US IN CONNECTION WITH YOUR USE OF THE SERVICES DURING THE THREE (3) MONTHS IMMEDIATELY PRECEDING THE EVENTS GIVING RISE TO THE CLAIM. SOME JURISDICTIONS DO NOT ALLOW THE EXCLUSION OF CERTAIN WARRANTIES. THEREFORE, SOME OF THE ABOVE LIMITATIONS ON WARRANTIES IN THIS SECTION MAY NOT APPLY TO YOU.THE PLATFORM AND THE SERVICES MAY CONTAIN TECHNICAL INACCURACIES, TYPOGRAPHICAL ERRORS, OR OMISSIONS. WE ARE NOT RESPONSIBLE FOR ANY SUCH TYPOGRAPHICAL, TECHNICAL, PRICING, OR OTHER ERRORS LISTED ON OR OMITTED FROM THE PLATFORM OR THE SERVICES. WE RESERVE THE RIGHT TO MAKE CHANGES, CORRECTIONS, AND/OR IMPROVEMENTS TO THE PLATFORM AND THE SERVICES AT ANY TIME WITHOUT NOTICE.SOME ASPECTS OF KITTYSHIELD (E.G., THE EMERGENCY NOTIFICATION FUNCTIONALITY REQUIRES THIRD PARTIES SUCH AS FIRST RESPONDERS TO ACTIVATE THE SYSTEM AND OTHER PERSONS SUCH AS GUARDIANS YOU HAVE IDENTIFIED TO RESPOND TO THE MESSAGES. KITTYSHIELD CANNOT BE RESPONSIBLE FOR THE ACTIONS OR INACTION OF ANY THESE PARTIES. You agree to defend, indemnify, and hold the KittyShield and The Catnip Times, Inc. Parties harmless from and against any damages, liabilities, losses, expenses, claims, actions ,and/or demands, including, without limitation, reasonable legal and accounting fees, arising or resulting from: (i) your breach of this Agreement; (ii) your misuse of the Platform, Content and/or the Services; (iii) your violation of any third-party rights, including without limitation any copyright, trademark, property, publicity, or privacy right; (iv) your Member Content; and/or (v) any claims brought against any KittyShield Party by a Third Party Partner as a result of your acts or omissions. We shall provide notice to you of any such claim, suit, or proceeding and shall assist you, at your expense, in defending any such claim, suit, or proceeding. We reserve the right to assume the exclusive defense and control (at your expense) of any matter that is subject to indemnification under this section. In such case, you agree to cooperate with any reasonable requests assisting our defense of such matter. The Platform and the Services are based in the United States. We make no claims concerning whether the Platform, the Services, and the Content may be viewed, or be appropriate for use outside of the United States. If you access the Platform, the Services, or the Content from outside of the United States, you do so at your own risk. Whether inside or outside of the United States, you are solely responsible for ensuring compliance with the laws of your specific jurisdiction. We reserve the right, in our sole discretion, to restrict, suspend, or terminate this Agreement and your access to all or any part of the Platform and/or the Services, at any time and for any reason without prior notice or liability. You may terminate your account at any time by following the instructions in your account settings. We reserve the right to change, suspend, or discontinue all or any part of the Platform and/or the Services at any time without prior notice or liability. In the event of a dispute arising under or relating to this Agreement (each, a “Dispute”), either party may elect to finally and exclusively resolve the dispute by binding arbitration governed by the Federal Arbitration Act (“FAA”). Any election to arbitrate, at any time, shall be final and binding on the other party. IF EITHER PARTY CHOOSES ARBITRATION, NEITHER PARTY SHALL HAVE THE RIGHT TO LITIGATE SUCH CLAIM IN COURT OR TO HAVE A JURY TRIAL, EXCEPT EITHER PARTY MAY BRING ITS CLAIM IN ITS LOCAL SMALL CLAIMS COURT, IF PERMITTED BY THAT SMALL CLAIMS COURT RULES AND IF WITHIN SUCH COURT’S JURISDICTION. ARBITRATION IS DIFFERENT FROM COURT, AND DISCOVERY AND APPEAL RIGHTS MAY ALSO BE LIMITED IN ARBITRATION. All disputes will be resolved before a neutral arbitrator, whose decision will be final except for a limited right of appeal under the FAA. The arbitration shall be commenced and conducted by the Judicial Arbitration and Mediation Services (“JAMS”) pursuant to its then current Comprehensive Arbitration Rules and Procedures and in accordance with the Expedited Procedures in those rules, or, where appropriate, pursuant to JAMS’ Streamlined Arbitration Rules and Procedures. All applicable JAMS’ rules and procedures are available at the JAMS website http://www.jamsadr.com. Each party will be responsible for paying any JAMS filing, administrative and arbitrator fees in accordance with JAMS rules. Judgment on the arbitrator’s award may be entered in any court having jurisdiction. This clause shall not preclude parties from seeking provisional remedies in aid of arbitration from a court of appropriate jurisdiction. The arbitration may be conducted in person, through the submission of documents, by phone, or online. If conducted in person, the arbitration shall take place in the United States county where you reside. The parties may litigate in court to compel arbitration, to stay a proceeding pending arbitration, or to confirm, modify, vacate or enter judgment on the award entered by the arbitrator. The parties shall cooperate in good faith in the voluntary and informal exchange of all non-privileged documents and other information (including electronically stored information) relevant to the Dispute immediately after commencement of the arbitration. Nothing in this Agreement will prevent us from seeking injunctive relief in any court of competent jurisdiction as necessary to protect our proprietary interests. If this Agreement is terminated in accordance with the Termination provision above, such termination shall not affect the validity of the following provisions of this Agreement, which shall remain in full force and effect: “Fees and Payment” (until you pay all fees and taxes due hereunder), “Intellectual Property,” “Member Content; Licenses,” “Communications with Us,” “No Warranties; Limitation of Liability,” “Indemnification,” “Termination of the Agreement,” “Controlling Law,” “Binding Arbitration,” “Class Action Waiver,” and “Miscellaneous.”Our failure to act on or enforce any provision of the Agreement shall not be construed as a waiver of that provision or any other provision in this Agreement. No waiver shall be effective against us unless made in writing, and no such waiver shall be construed as a waiver in any other or subsequent instance. Except as expressly agreed by us and you in writing, this Agreement constitutes the entire Agreement between you and us with respect to the subject matter, and supersedes all previous or contemporaneous agreements, whether written or oral, between the parties with respect to the subject matter. The section headings are provided merely for convenience and shall not be given any legal import. This Agreement will inure to the benefit of our successors, assigns, licensees, and sublicensees. Copyright 2017 - 2019 KittyShield by The Catnip Times, Inc. All rights reserved. Copyright © 2019 KittyShield | All rights reserved.